The legendary filmmaker reminisces about his otherworldly sci-fi classic. OUTER LIMITS, INNER SPACE Roeg focuses his camera and prepares to go deep. A figure skitters down a hill; is he a back-to-the-land camper, a lost banker, some tourist off the beaten path? Once you realize hey, that's David Bowie on the cusp of his Thin White Duke phase, it's immediately apparent that our hero is not from around there—or even of this universe. Released during the year of our nation's bicentennial, The Man Who Fell to Earth is cited by Bowie-ologists as the high point of the rock star's screen career—really, who better to play a starman swallowed up and spat out by post-Nixon America? 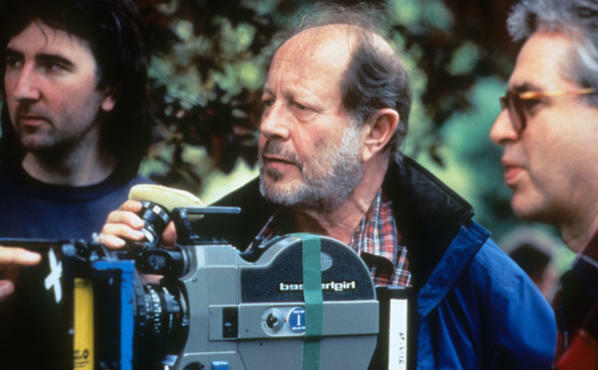 But the movie's fractured, spacey feel and cutting social critique come straight from the head of visionary filmmaker Nicolas Roeg. As Film Forum celebrates this movie's 35th anniversary with a two-week revivial, TONY spoke to the 82-year-old British director about one of sci-fi cinema's strangest trips. Time Out New York: The film is so associated with a distinct moment in the mid-'70s, yet it seems more contemporary than ever, don't you think? You were ahead of the curve in many ways, especially regarding the media. That's one of the perils of making a science fiction movie, isn't it? What were Albert Einstein's final words? "Something out there is moving!" What do you mean by that, Albert? What is it that's moving, exactly? [Laughs] I'd say that statement is really the basis of all science fiction. [Pause] Do you know I'd considered Michael Crichton for the role? Indeed. I was in Los Angeles at a party and I'd been thinking, The movies always treat aliens as little green men. I imagine if aliens came down to Earth, they'd actually be quite tall; people seem to get everything right about extraterrestrials but the size! At that very moment, this dashing man walked over who seemed to be seven feet tall. That was Michael Crichton. I think we even discussed the idea of him playing Mr. Newton for a while after that first meeting. [Pause] Obviously, we went another way. Obviously. How did you decide on casting David Bowie for the role? Do you remember the conversations you both had about Mr. Newton, how he was going to play him, and so on? We really didn't need to talk about the role at all; he was the part the moment he stepped on to the set. During the first week of shooting, there were some studio folks lurking about—more to meet David Bowie than anything else, I'd imagine—and they expressed a few reservations. "He seems a little...odd, don't you think?" And I told them, "The character is an alien; how is he supposed to act? Like he's Gary Cooper?" [Laughs] It wasn't like David was unfriendly—we had dinner together numerous times, and he ran a lending library out of his trailer, which was full of books on every subject imaginable—but he kept himself separate to the point that others started to think of him as this mysterious "other," you know? So much of that performance is simply Bowie being himself—and that's what's so brilliant about it! You've never been afraid of thinking outside of the box when it comes to casting, however...or in how you approach the structure of storytelling overall, would you say? I've always admired the tradition of storytellers who sat in the public market and told their stories to gathered crowds. They'd start with a single premise and talk for hours—the notion of one story, ever-changing but never-ending. They weren't bound by standard narrative arcs or chronology; they'd drift in and out of the narrative, tell you the ending then flash back to something that happened to the middle. It's a wonderful way to tell a story, really. Though not everybody thinks so. By which you mean studio executives, I take it? I'd made a number of films that way prior to The Man Who Fell to Earth, and I was still getting notes saying, "Can't you make this more straightforward?" during production. There's no one "right" way of making a science fiction movie; there's no one way of making any kind of movie, really! All knowledge is connected in one way or another. Some days you see the connections in one form, and other days, you see how things are related in completely new ways. I would hate to just make a simple genre movie. [Pause] I hate the word genre...it's so confining! The film offers a conflicted look at America in '76; how did it reflect your own experience as an outsider working in this country? In a lot ways, I was like Mr. Newton—someone seeing America as this vast, strange and overwhelming place. But I have to say, America accepts the notion of being a multifaceted individual more than any other country, probably because it's made up of people who generally don't conform to any one ideal or ideology. It's an extraordinary experiment, this country of yours. You've mentioned that alienation is a recurring theme in your work, as is the concept of transformation. What is it about these two subjects that keeps you circling back to them time and again?